Samsung may have a new smartwatch to show alongside the Galaxy S10, and assorted other goodies, on February 20. A leak has shown what’s being referred to as the Samsung Galaxy Sport, or the Galaxy Active smartwatch, which we can take to be a sequel to the old Samsung Gear Sport smartwatch. Samsung abandoned the Gear branding, and moved to plain Galaxy branding, on the Galaxy Watch announced late last year, so we assume it will do the same for a Sport model. While we’ve heard a few rumors about the upcoming watch so far, we now have a much better idea of what the watch will look like. SamMobile recently leaked a number of renders and images of the watch and its software. SamMobile’s article has since been removed — and we’re not sure why — but we were able to get our hands on the images and renders from other outlets. Notably, it looks like Samsung is adopting its cleaner One interface for the watch — a style that the company first showed off at the Samsung Developer Conference. Earlier, a leaked render has given us our first look at the watch, and immediately there is a problem. The new Sport doesn’t appear to have a rotating bezel, unlike the Gear Sport and the Galaxy Watch. Think this sounds like a small issue? It’s not. The rotating bezel made scrolling through lists of options, different features, and your notifications a pleasurable and more precise experience. Swiping up and down on screens covers up what’s displayed, gets it all messy with fingerprints, and isn’t always very accurate. We’re basing this on the watch’s appearance in the render. The watch face doesn’t have a bezel at all, and appears to more closely resemble the Motorola Moto 360 or the original Huawei Watch than the fitness-oriented Gear Sport. There are two buttons on the side of the case, which seem to be nicely sunken into the body, but that’s all on the control side. It seems that at this stage, Samsung will make you swipe and not twist on its next smartwatch — unless it introduces a special new touch-sensitive body to keep the feature alive in a high-tech way? The leak does not show the watch from other angles, but does state a heart rate sensor will be on the back, and that the device will have GPS and Samsung’s extensive fitness tracking software inside. Expect Samsung Pay to operate, along with the new Bixby Reminders feature. Samsung is likely to improve Bixby on the Galaxy S10, so expect the virtual assistant to play a larger part in its wearables in the future. Other possible features include 4GB of RAM, and a degree of water and dust resistance. Will the Galaxy Watch Sport, or Galaxy Active, be yet another device shown during the February 20 Unpacked event? We won’t find out for sure until the day, but as the Gear Sport is more than a year old now, Samsung may choose to announce a sequel at any time. We don’t know the price yet, but we can take the $ 300 Gear Sport as a guide. For now, that’s all we know, but we’ll keep you updated with Galaxy Watch Sport/Galaxy Active news here. 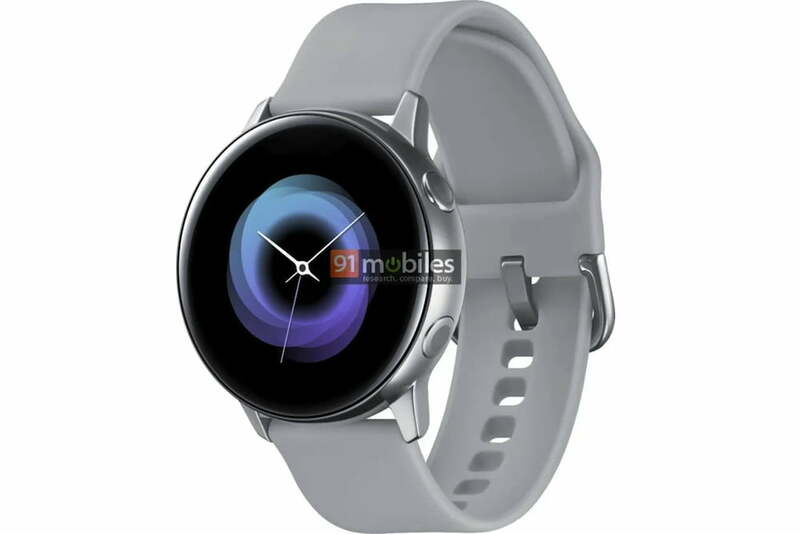 Updated on February 12, 2019: SamMobile has leaked a number of images of the Galaxy Watch Active and its software.